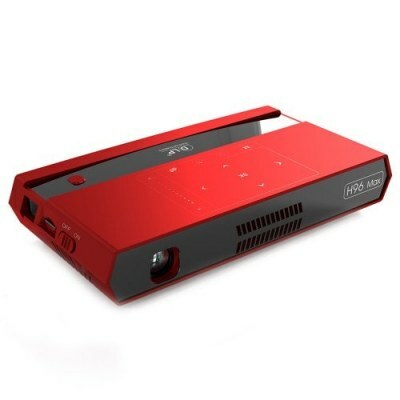 With DLP (Digital Light Processing) projection technology and integrated LED light source, the H96 MAX portable video projector features a native resolution of 854 x 480 pixels and supports 1080P compatibility. It offers a brightness of 3000 lumens, a contrast of 400:1, a projection distance of 0.5 to 7.5 meters for displays from 30 to 200 inches, a lamp life of more than 20,000 hours. It is equipped with a 3 W loud speaker. The H96 MAX Projector using 2.4G/5G AC Wifi with stable transmission without stutter, effectively avoid signal interference. Play 4K HD movies fluently. The projector features a wearable, coated glass lens andhigh quality LED bulb, that ensures screen bright,stable and light life up to 20000 hours. 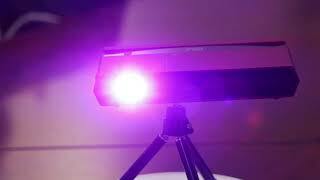 The H96 MAX projector uses DLP display technology, Hd 4K decoding with 200 inch giant screen. You canwatch movies comfortably at home. Vertical keystone correction -45° +45°, you can watch movies more freely by adjusting screen picture. You can experience 200 inch picture without screenIt applies to many types of houses. No matterhow big the house is, how big is the cinema. Connecting the H96 MAX projector with the computer or cellphone,it realizes the same screen display You also can plug in theU disk or connect HD-IN interface to work easily. The H96 MAX DLP Projector uses an Amlogic S912 Octa-core SoC associated with 2GB of RAM and 16GB of storage. It features 2.4 GHz Wi-Fi and Bluetooth 4.1 connectivity. Two USB ports are available, as well as a microSD card reader. It is supplied with a remote control. This small projector runs an Android 6.0 operating system. Located in the entry-level segment for this type of device, it currently benefits from a promotion on Gearbest with a reduced price of $299.99.